H.E Lim Rathanak ,Ph Advisor of the Royal Government of Cambodia , Department of DRUGS and FOODS. He do a quick presentation on basic regulation on Food Safety in Restaurant . Mr. Try Chhiv, Secretariat of National Committee for Tourism Professionals(NCTP) has a short introduce on ASEAN Skill Passport. He highlights the advantage of using this Passport and how to apply for Skill Passport. The event follow by Ms. Saya Marta, HITT Master Trainer who will introduce the Hospitality Training Course/ High Impact Tourism Training( HITT) which is under management of CRA . She will present training module, schedule and training method. Most of the industries are concerning with staff turnover or Lack of services staff. Thus, We hope that you will find an interesting information from this course. 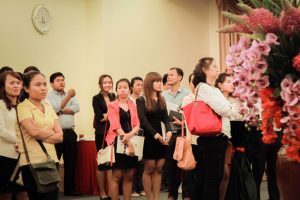 Additionally, Mr. Chansy, Vice President of CRA/ Park Café ‘s Managing Director provide a update information on Restaurant Industry in Phnom Penh. He will focus on the figure and trend of restaurant industry in Phnom Penh.